The Spanish region of La Rioja (the smallest in mainland Spain), famous for it's winegrowing, is landlocked, it's borders lying approximately 75 south of the Bay of Biscay and 75km south west of the Pyrenees. 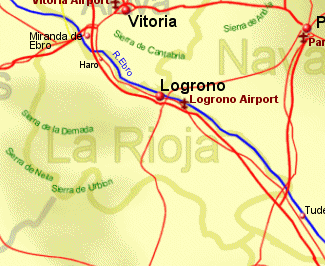 It is bordered by Castilla y Leon to the south and by the Basque country and Navarra to the north east, the border with the latter two mostly marked by the River Ebro on it's way to the Mediterranean. The capital city of Logrono sits astride the river Ebro at a point where the border with Basque and Navarra is conveniently a few Km away from the river. There are around 14,000 vineyards in the region of La Rioja with a total of 50,000 Ha of vines.